The Skyfighter references to the past with a range of details, such as its bi-compax pilot chronograph configuration. The pilot chronograph is one of the most classic military pieces. The uncluttered dial provide enhanced legibility, crucial to pilots. Don't be fooled by its stylish looks, it's the perfect expedition watch, but then again, it’ll look just as good at the office. We've always been captivated by vintage objects, notably watches. The military has always been a source of innovation in terms of design usability and robustness. Naturally, vintage military watches was one of our main source of inspiration for the Pioneer Collection. 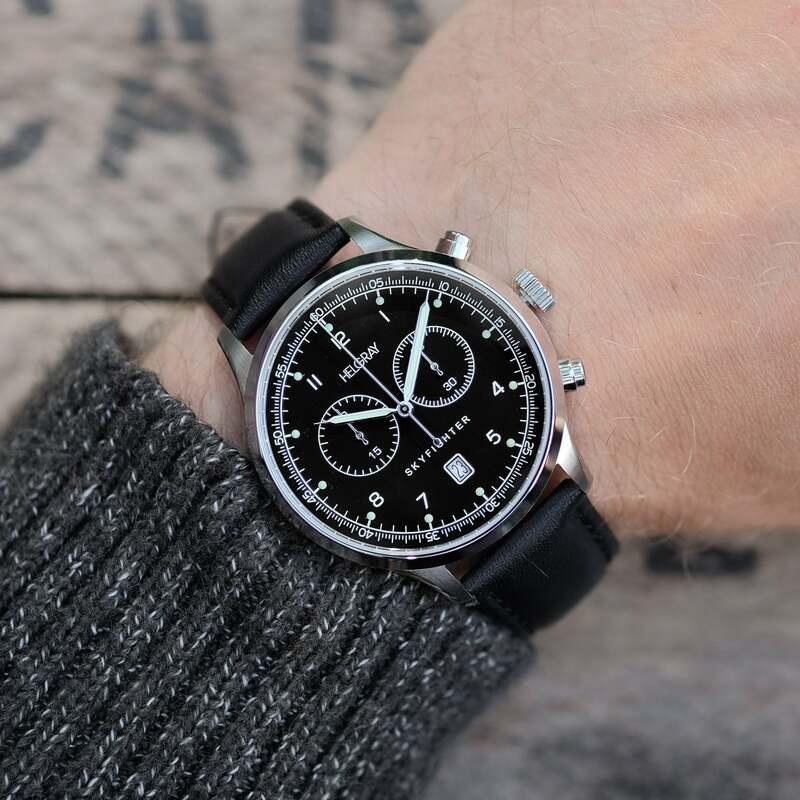 The demand for chronographs, watches with a stopwatch function grew quickly along with the aviation industry in the early part of the 20th century. The Skyfighter was designed in a bi-compax configuration, with a central sweep second and a 30-minutes counter. If there is one thing we did not compromise on, it's quality: stainless steel (grade 316L) case, sapphire crystal with anti-reflective coating, Swiss quartz movement, diamond-cut hands, Super-LumiNova luminescent pigment, calfskin leather band. The Swiss Ronda quartz movement powering the Skyfighter offers incredible time-keeping accuracy, virtually no maintenance, and is easy to replace if needed. This is what we call uncomplicated ownership. Styled after vintage pilot chronographs, the Skyfighter brings back a classic look in an updated package. The versatile 42mm case is easily dressed up or down depending on your needs. One of the key requirements of military watches is the presence of luminescent pigment on the dial and hands. Luminescence allows one to read the time accurately even in very poor or low-light conditions. It can come in very handy during a critical mission... or a midnight run to the convenience store.